I’m making wonderful friends through the world of twitter. Two of my new friends are Travis Justice and Pat Campagna, the founders of the Total Tuscany website. We discovered through a podcast interview that we have a number of things in common. We love Tuscany, as well as its food, and wine. Our first journey to Italy was as adults. We agree that traveling with families and groups of people can lead to interesting—and later hilarious—stories. We all love to stay in and near the small hill towns of Tuscany. We’re newbies to the social media and techie world of websites, facebook, pinterest, and twitter. Travis was a TV Sports Anchor and has a radio broadcasting studio in his house. My father was a sports play-by-play broadcaster on the radio for years. Travis and Pat live in Nebraska, the state I grew up and lived in until college. And let’s not forget how the men of Total Tuscany and I met! Travis and Pat are on a mission to share their love for Tuscany by sharing their knowledge and resources with people through their website and podcasts. 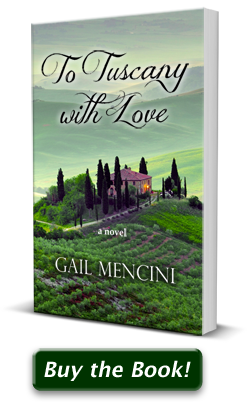 I am on a mission to share my love of Tuscany through the eyes of my characters in my Tuscany series of books. Listen to Travis, Pat, and I chat about Tuscany, my debut novel, To Tuscany with Love, our travels to Italy and more in this podcast. 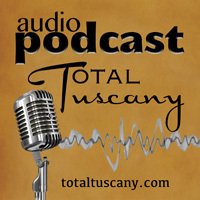 You can learn more about Total Tuscany, Travis and Pat at their website: http://totaltuscany.com.